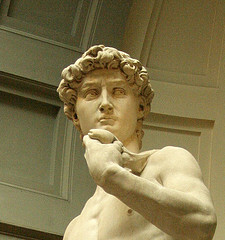 The next time you sit down with your book manuscript think of yourself as a sculptor. Michelangelo once said, “Every block of stone has a statue inside it and it’s the task of the sculptor to discover it.” Manuscripts are often a lot like that. First drafts contain a lot that needs to be chipped away to get down to the book's essence. Too often writers try to cram far more into their manuscript than one good book can possibly contain. Whether you decided to include all events great and small in your memoir, every ancestral line in your multigenerational family history, or to make sure that your novel provides a full back story for every character, no matter how minor, you’ll face the same problem. Take a hammer and chisel to that huge block of granite you have produced. Good writing is chopping away what is not essential. Wolfe was a man who spoke from bitter experience. When he sent the manuscript of O Lost to editor Maxwell Perkins at Scribner’s, it was 330,000 words typed on 1,114 onion skin pages. What followed is wonderfully described in A. Scott Berg’s biography Max Perkins: Editor of Genius. When it was published, as Wolfe’s first novel, Look Homeward Angel, it was 90,000 words shorter than the draft. The book became an American classic.